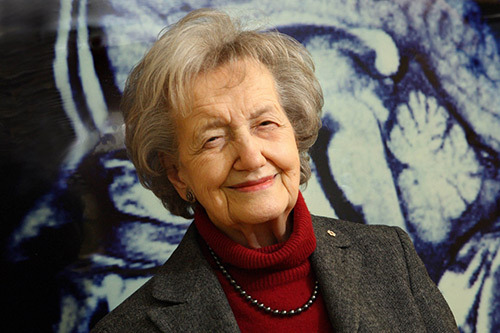 Looking back on her 96 years, science legend Brenda Milner, Ph.D., has some advice for young people who are thinking of a career in science: “Know yourself.” It’s the same advice that Plato gave, but in Dr. Milner’s case her guidance relates to some specific factors: know what you’re good at, and find something you care about so much that you’re willing to endure the long hours, tedium, and discouragement that can attend a career in science. Her own life is an example of the advice she gives. Today this McGill University researcher is known as the founder of neuropsychology, and is legendary for her contributions to neuroscience. The honors that have come her way include more than 20 honorary doctorates, memberships in the Royal Society of London, the Royal Society of Canada, and the National Academy of Sciences and, last year, the Kavli Prize in Neuroscience. However, it was a long road to reach the heights that she has now attained. Interestingly, her home environment would not have led someone to predict a scientific career. Both parents were musicians and her opera critic father homeschooled her. “I did a lot of German and Shakespeare with him and French with my mother” she remembers. The homeschooling also included some mathematics, and when later on she attended the Withington Girls’ School, her dream was to study math at Cambridge. To read the rest of this article as published in our April 15, 2015 issue of GEN, click here.